I always see vitamin D supplements being advertised but not enough quality information being put out about the benefits of it. It’s well known that vitamin D (along with calcium) is important for bone health for both adults and kids. A report from the American Academy of Pediatrics emphasized the importance of kids getting enough calcium and vitamin D rich foods. Foods that have a rich source of vitamin D include milk, eggs, fish, vegetables, and whole grain cereal. Receiving vitamin D from a nutritious diet is key to establish a foundation for healthy bone development and maintenance. There's a lot more to Vitamin D than meets the eye. It serves a variety of functions in the body. Unfortunately, most of us don't get enough vitamin D on a daily basis, with a reported one billion people worldwide having a deficiency. 1. Vitamin D supports your skeletal system. When you think of strong bones, calcium often comes to mind. Calcium is the major player when it comes to bone health and increasing bone mineral density, but don't overlook the importance of vitamin D.
Previous research has shown that vitamin D is a strong simulator of calcium deposition in bones, making them stronger and healthier. If you're not getting enough vitamin D, your body begins to slow or stop depositing calcium into bones, eventually drawing calcium out from your bones back into the bloodstream. Over time, this constant cycle of deposit and withdrawal will make your bones weak and at high risk for fractures as you age. 2. Vitamin D helps you recover faster after exercise. The day after a good workout can make sitting a little difficult or washing your hair a challenge. Feelings of soreness, stiffness, and fatigue will affect performing the days following too. Vitamin D definitely helps this situation. Studies show that having adequate levels of vitamin D levels helps recovery after exercise. Additionally, vitamin D deficiency is relatively common in athletes and is associated with muscle weakness and atrophy, specifically Type 2 muscle fiber atrophy. Skipping out on this vitamin is just as bad as skipping out on leg day. 3. Vitamin D aids in keeping your arteries healthy. Arterial health effects heart health along with other factors such as diet, weight, and stress. Scientific literature supports the link between vitamin D inadequacy and poor arterial health. One of the reasons may be that vitamin D is necessary for blood vessels to maintain their normal function and flexibility. Arteries are blood vessels that act like highways in our bodies, delivering oxygen and vital nutrients to various organs. Aging as well as lifestyle and dietary factors can cause arteries to stiffen, lose their flexibility, and even harden. This could lead to an increase risk of cardiovascular disease. A simple way to help avoid this is by getting enough vitamin D.
When looking for a vitamin D supplement, choose the D3 form. Gel caps are a great option. Liquids are good too. How much you take depends on many factors. How much sunlight you get, ethnicity, where you live and the type of clothing you wear. If you really want to dial it in, get your levels tested. How much of this overlooked vitamin should you be getting a day? Currently, the Institute of Medicine Food and Nutrition Board is the governing body that sets guidelines for intakes of all kinds of nutrients, including vitamin and minerals. The recommended daily allowance (or RDA) for vitamin D is currently 600 IU per day for men and women between the ages of 9 and 70. However, it is likely that this value is an underestimation. The currently established upper intake level is 4,000 IU per day, but research has reported no adverse health effects to taking 6,000 IU per day. Keep in mind that the RDA value is primarily based off of outcomes centered around bone health, without taking all of the other beneficial things that vitamin D does into account. The take home point is that you should be much more worried about getting too little vitamin D than too much. Cows are ruminants, and continuous grazers. Ruminants are mammals that are able to get nutrients from plant-based food by fermenting it in a specialized stomach prior to digestion. Cows have a four compartment stomach and scientist define them by saying they have a miraculous gut. On average, high quality milk is 27 percent protein, 37 percent lactose (milk sugar), and 30 percent fat. The remaining 6 percent is calcium, and other minerals. The high percentage of lactose has given some people digestive issues for a long time. Up to 30 percent of adults have varying degrees of allergic responses to lactose. This is because lactase, its digesting enzyme in the gut, declines during childhood. There at least 14 different proteins in milk split into two groups called casein proteins and whey proteins. Casein represents about 80 percent of milk protein. Casein has poor results in producing lean mass in athletes, and in hospital studies of muscle loss. But it definitely has its use in some cases. Whey represents about 20 percent of milk protein. Whey has superior results to any other protein, including eggs, meats, fish, soy, nut, pea, rice, and other plant proteins, in producing lean mass in athletes, and muscle in hospital studies. That is not to say that you should only consume whey protein if you want to gain lean muscle. To legally call a product whey protein concentrate there has to be a lot of things at play. I won't bore you with the statistics but you will see a lot of cheap whey for sale in bulk stores and discount markets. If the individual selling the product does not say that the content of their product is between 30-90% whey protein then leave it on the shelf. The protein content should be on the label. Just because it says ‘Whey Protein Concentrate’ doesn’t mean it is something you should be consuming. They could be using low grade protein and that could be giving you the digestive issues. Near the top end of the whey scale (70 to 89 percent protein), only 10 to 25 percent of the mix is fat and lactose. That’s where you want your whey to be. Whey protein concentrate can be further extracted to become whey protein isolate. The higher price of whey isolate can be money wasted in some cases as well. High end concentrates and isolates are fast proteins. This means they absorb fast when compared to meat or other sources of protein. Isolates can contain less lactose but the variance is pretty small. Isolates and hydrolysates go through a heavier refining process which can benefit those who need more protein in their regimen but have a hard time digesting it. Half the dry weight of your body is protein. The quality of your proteins determines both the quality and the quantity your individual DNA. Quality of the proteins in milk depends on the nutrition of the cows and the method of protein extraction. So make sure you are not going cheap when it comes to protein supplementation. If you are going to put it into your body then make sure you are doing the research and asking the right questions prior to consumption. 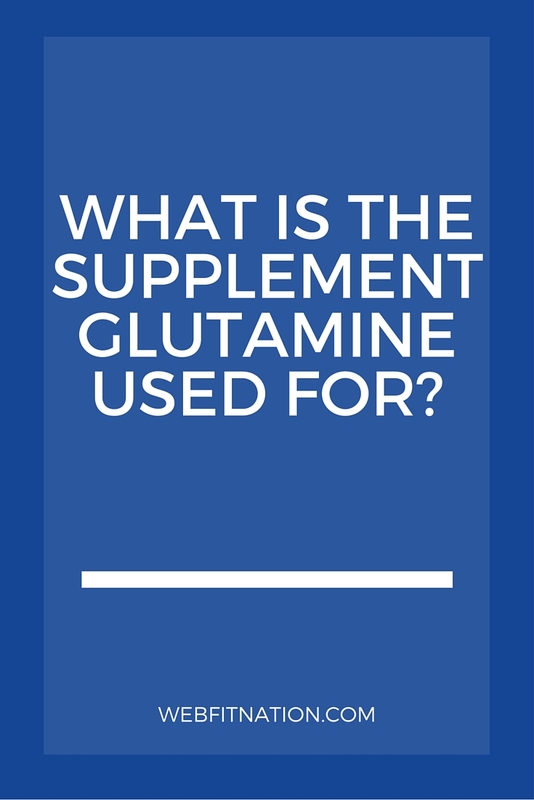 What Is The Supplement Glutamine Used For? Glutamine is the most abundant amino acid (building block of protein) in the body. The body can make enough glutamine for its regular needs, but extreme stress (the kind you would experience after very heavy exercise or an injury), your body may need more glutamine than it can make. Most glutamine is stored in muscles followed by the lungs, where much of the glutamine is made. Glutamine is important for removing excess ammonia (a common waste product in the body). It also helps your immune system function and appears to be needed for normal brain function and digestion. Glutamine also aids in wound healing and recovery from illness. When the body is stressed (from injuries, infections, burns, trauma, or surgical procedures), it releases the hormone cortisol into the bloodstream. High levels of cortisol can lower your body’s stores of glutamine. Athletes who train for endurance events (like marathons) may reduce the amount of glutamine in their bodies. It’s common for them to catch a cold after an athletic event. Some experts think that may be because of the role glutamine plays in the immune system. Glutamine can be a crucial supplement for strength athletes as well. It will aid in the recovery of damaged muscle tissue from hypertrophy training as well as strength training. Supplemental glutamine is often given to malnourished cancer patients undergoing chemotherapy or radiation treatments and sometimes used in patients undergoing bone marrow transplants. Certain medical conditions, including injuries, surgery, infections, and prolonged stress, can lower glutamine levels, however. In these cases, taking a glutamine supplement may be helpful. You can usually get enough glutamine without taking a supplement, because your body makes it and you get some in your diet. Dietary sources of glutamine include plant and animal proteins such as beef, pork and poultry, milk, yogurt, ricotta cheese, cottage cheese, raw spinach, raw parsley, and cabbage. Glutamine, usually in the form of L-glutamine, is available by itself or as part of a protein supplement. These come in powder, capsule, tablet, or liquid form. Typical doses range from 500 mg to 5,000 mg daily depending on the circumstance. Take glutamine with cold or room temperature foods or liquids. It should not be added to hot beverages because heat destroys glutamine. Glutamine supplements should also be kept in a dry location. Most of the supplements of today that are advertised heavily cost an arm and a leg. All natural, holistic supplementation of some very basic ingredients that have been around since the beginning of time are often overlooked. They either don't have "miracle cure" tied to them or they were not on the latest episode of the latest talk show. Aloe vera is one of the world’s most-used natural plants, with a market worth an estimated $13 billion a year. It’s also one of the oldest. Historical documents make mention of aloe vera as medicine circa 65 AD, when it was used to treat soldiers’ wounds and bleeding. But those benefits were only a peek into what this magnificent plant could really be used for. All of the nutrients in aloe vera juice are perfectly balanced in a way that is ideal for the body in terms of healing and repair. Although it is not a miracle cure, it contains enough nutrition to significantly help with healing the body, as well as provide other benefits. Some of the earliest uses of aloe vera involved the use of its sap, which is different from the gel. The sap, found just beneath the leaf’s epidermis, was used as a powerful purification supplement during the 18th and 19th centuries. If you want to give it a try, add 1/2 to one ounce of aloe vera gel into a daily smoothie. It does have a bitter taste, which is why lemon or lime juice works well to mask it. If you intend to use aloe internally, be sure you’re using a certified, purified version. This is one supplement that belongs in your pantry.